The easiest way to get to St Barts is through a connection flight in St Martin. Other possibilities include via San Juan, Guadeloupe, St Thomas and Antigua. 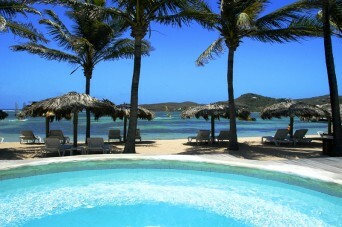 Hotel Guanahani and Spa is located on Saint Barthelemy Island in the middle of the Caribbean Sea. St Barts is a little bit of France, colonized by the British in the 17th century, where a gentle way of life is still maintained. Guanahani has coloured cottages scattered amongst tropical gardens – it is a luxury peaceful oasis located on the north east of the island overlooking Marigot Bay. The hotel is set on its own private 16 acres on a peninsula three kilometers from the airport of St Barthelemy. There are a variety of rooms and suites for you to choose from for your stay at Guanahani. All of them have a private terrace or balcony and garden. Each cottage is designed with Creole style and built with rare woods, pastel shades and lovely cotton fabrics. There are also a variety of fantastic Butler Suites and Family Suites – these are 1 – 3 bedrooms in size and come with private pools and each one is individual. For detailed information please refer to side menu “Guanahani Rooms and Suites”. The restaurants at Guanahani will tantalize your taste buds by offering you the most tempting of cuisines. There is a choice of restaurants, and breakfast is included daily in your hotel rate. The free of charge activities on offer at Guanahani include use of tennis courts, snorkeling, windsurfers, canoes, pedal boats, fitness room, daytime Kindergarten and Juniors. Activities which cost extra and can be organised include jet skis, fishing and sailing boat rentals, scuba diving, professional windsurfing and tennis instructors, and the resort boutique. There is of course also the Spa where you can pamper yourself with one of the many world class treatments or massages on offer. The Guanahani Spa specializes in Clarins treatments and Frederic Fekkai hair treatments. The Spa is located in the heart of the tropical island and offers luxury, comfort and elegance to its guests.